Jump At The Sun, 9781423119548, 32pp. It only takes a few words to create change. It only takes a few people to believe that change is possible. And when those people sing out, they can change the world. "We Shall Overcome" is one of their songs. From the song's roots in America's era of slavery through to the civil rights movement of the 1960s and today, "We Shall Overcome" has come to represent the fight for equality and freedom around the world. 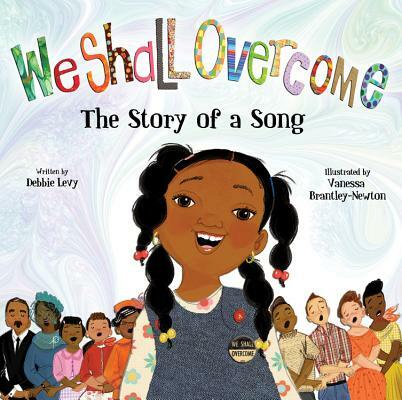 This important book, lyrically written by Debbie Levy and paired with elegant, collage-style art by Vanessa Brantley-Newton, pays tribute to the heroic spirit of the famous song that encompasses American history. Debbie Levy (www.debbielevybooks.com) is the author of The Year of Goodbyes, Imperfect Spiral, Maybe I'll Sleep in the Bathtub Tonight, and many other books for young readers. A former newspaper editor and lawyer, Debbie is a graduate of the University of Virginia and the University of Michigan Law School. She loves to read, kayak, fish, swim, and take long walks. Debbie lives in Maryland with her husband. They have two grown sons. Vanessa Brantley-Newton (oohlaladesignstudio.blogspot.com) attended both the Fashion Institute of Technology and the School of Visual Arts in New York City, where she studied fashion and children's book illustration. She is the illustrator of Ruby and the Booker Boys; Let Freedom Sing, which she also wrote; One Love; and Presenting Tallulah, by Tori Spelling, along with many other books. Vanessa lives in East Orange, New Jersey, with her husband and daughter.